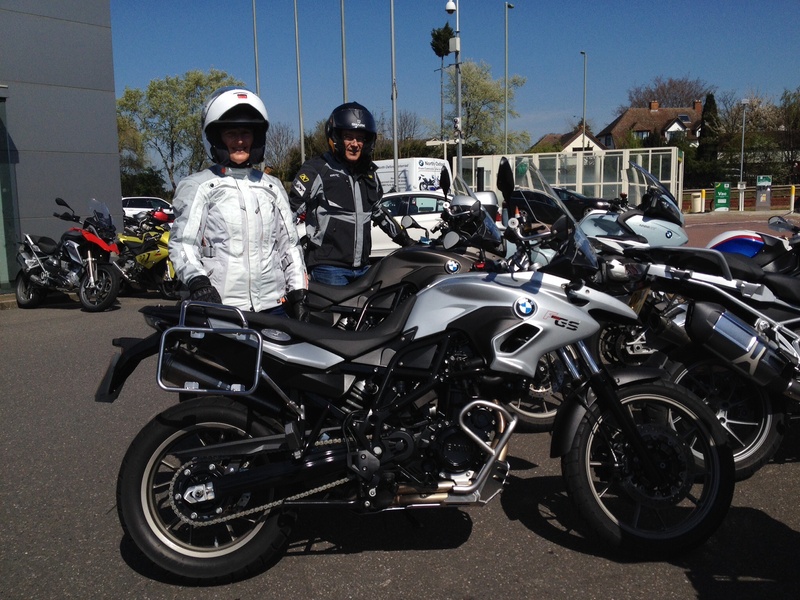 Here it is, while we have been acquiring the bits and pieces, today we collect our motorbikes from BMW North Oxford. We are greeted by a beautiful blue sky English spring day. We are lucky Anthony’s sister can drive up with us so as to drive back while we ride back. Only when we turned off the A34 into Oxford at the roundabout we had ridden past on the test ride back in January 2014 did the butterflies start instantly for both of us. We have 90 miles to ride on new motorbikes back to Verwood. We enter the showroom and there are the motorbikes, gleaming clean, with all the accessories added, crash bars, pannier racks, screen and scottoiler fitted standing in the centre of the showroom with the “These bikes have been sold do not sit on them” signs. Lots of paperwork later and a helpful discussion with the service department and we have decided on what to take as spares and how the last service would be undertaken. They have kindly allowed us to sit on on the service so we can see the simpler things to undertake ourselves. After availing ourselves of the excellent BMW guest facilities with our sandwiches, we leave the show room. Ready to go, gear on, Anne finds she has brought two left gloves! Gloves are obviously an issue for us as we packed two pairs of Anne’s gloves and none of mine when we left Australia. My sister has offered to write our names and “L” & “R” in each of our gloves. We should probably take her up on the offer!!!!! Good thing I have both my new pairs of gloves so Anne can ride with one large right glove of mine. contents of the reservoirs on the back of the motorbike, mostly on one side of the tyre. As the weather was sunny and we undertook no radical cornering this was not a problem. It did however highlight that we need to both check and understand the equipment on the motorbike. The motorbikes will be valeted on our service visit to Oxford in mid May. We proceed without incident, but careful on all right hand turns.